Where family fun & friendliness is guaranteed. 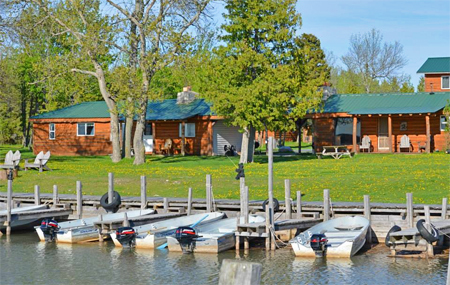 Drummond Island Maps and Information - Upper Peninsula Cabin Rentals, Fishing & Boat Rentals. Welcome to our Drummond Island information page. Learn about Drummond Island: size, facts, topography, ferry services, community, population, The Plains, along with our seasons. Drummond Island is truly the "gem of the Huron". Lying at the northern end of Lake Huron, Drummond Island is 136 square miles, the largest island in the Great Lakes. It's 87,000 acres are edged by 150 miles of shoreline. Approximately 2/3 of the island is owned by the State of Michigan. The diverse topography ranges from Cedar swamps to rock ledges, prairie meadows to groves of hardwoods, rocky shores to sandy beaches. There's plenty of area for hiking, biking, photography, bird watching, stargazing, hunting and fishing, recreational vehicles and exploring. Your adventure begins with a one mile ferry ride across the St. Mary's River. The ferry, capable of holding 36 cars, crosses the river hourly bringing cars, passengers, trucks and semi-trucks across to the island. There are no advance ticket sales. Vehicles line up in DeTour waiting to board the boat. The round trip ferry fare is collected by the deck hand once you are safely on board. The ferry service provides year-round access to the island. Drummond Island is a small community with approximately 1,000 to 1,200 full time residents. In the summer the "Snowbirds" return, and the population doubles. The roads on Drummond Island are mostly paved or improved. Once here, you will experience a place to rest, reflect, and breathe fresh air. As you travel and explore you'll notice 'most everyone waves. Drummond Island is a friendly place with some of the nicest folks you'll ever meet! You can also arrive by private plane or boat. The airport has a 4,000 foot paved and lighted runway and there are three marinas on the island. One of the most unique and ecologically sensitive features of Drummond Island is the area called "the Plains". Located on the northeast portion of the island, it is home to many plants and animals. Because of the unique nature and unusual plants the Nature Conservancy is protecting hundreds of acres from development. The area is one big sheet of limestone with a shallow layer of soil on top. Fissures in the limestone have allowed ribbons of trees and shrubs to wind through this fairly flat land. The trees, though old, have stunted growth because of the harsh conditions. Very little soil, many plants and trees competing for nutrients and arid like conditions curtail normal growth for the Aspen, Birch and shrubbery. Deer have added to the stunting by browsing on these low growing plants. The road that winds through the area looks like pavement but on closer examination, it is a sheet of limestone that has been cleared of soil. If you look close and sweep away the dust on the road you might find fossils in the limestone. Also on the road you'll see gouges, or chatter marks, in the limestone. These were caused by the most recent glaciers as they scraped their way dragging rocks and boulders 10,000 years ago. The scrapes, parallel to each other, run basically in a north-south line. In the early summer the area is awash with mauve as the Prairie Smoke blooms in clumps. Prairie Smoke, a state protected, threatened plant is an unusual inhabitant of Michigan. More indigenous to the northern Great Plains, it has made a home here and the wispy plumes move gently in the summer breezes. The combination of sub-arctic, Great Lakes and prairie plants make this habitat rare and unique. A note about the Plains area. It is extremely fragile and easily susceptible to disturbances, even one as innocent as walking through the area or picking up a small rock puts the balance at risk. Please be kind, walk the roads, enjoy the scenery, and take lots of pictures. No matter what time of the year you are thinking of vacationing, the island has many things to offer with each season. Spring: Begins with the spring perch and smelt runs in April. In May arrives the opening of Northern Pike, Walleye, and Bass seasons. Morel mushrooms are also in abundance at this time. See the many wild flowers come to life in the Maxton Plains and Nobs. It is also the return time of the Sandhill Cranes. Summer: Offers many outdoor activities for the whole family. Golf at one of the 2 courses, fishing is good throughout the summer for northerns, walleye, smallmouth bass, cisco and salmon. You'll find hiking, bike trails, canoeing, tennis courts, sand beaches, and 4-wheel drive trails. The numerous bays and outlaying islands offer unending boating, watersports, and sightseeing activities. Fall: Fall brings the changing of the colors in the upper penninsula. The splendor of the orange, red, green (pines) and the yellows is breathtaking. Both big and small game hunters travel to Drummond Island to spend their hunting vacations. If it's jumping Mallards up the Potagannissing River, stalking trophy whitetail buck, or listening to your beagle run a snowshoe rabbit, Drummond has the game and area to give you a rewarding hunt. Drummond is an 87,000 acre hunter's haven and its over 50% state owned. 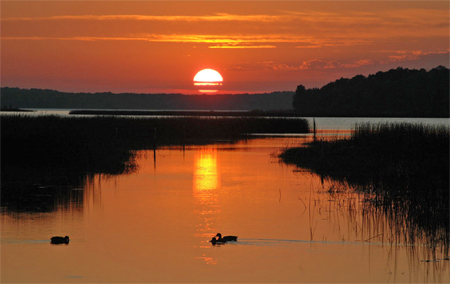 Ducks, grouse, woodcock, rabbits, fox, coyote, bobcat, deer and black bear are just some of the animals that call Drummond Island their home.